The standard of heavy and light goods vehicles on our roads has improved greatly over the past five or six years and this has been down to the implementation of a higher standard of VTN test. In 2005, new legislation was introduced where all vehicles were put through stringent tests to ensure their roadworthiness and it certainly has improved the standard of vehicle on Irish roads, while it has also played a huge part in the safety aspect of driving. Conveniently located on the N65 between Loughrea and Ballinasloe, Co Galway, the state-of-the-art vehicle testing centre facility, serves the areas of Galway and the mid-west counties of Offaly, Tipperary, Roscommon, Clare and Westmeath. Priority VTN tests heavy and light commercial and company business vehicles for roadworthiness, as well as undertaking calibration of tachographs and speed limiters. “We carry out vehicle testing inspections on behalf of the Department of Transportation. The equipment used is compatible with all new European Communities (EC) regulations and is state-of-the-art, modern technology, used by professional, certified and experienced technicians,” said Damien. Every test must be carried out to the specific regulations that have been put in place by the EC and Damien admits that there are no shortcuts taken during a test. Priority VTN test both light and heavy commercial vehicles and as part of their facilities, there are two bays one for each of the tests. “We are available to carry out tests five days a week. We endeavour as much as possible to fit in a test to suit our customers busy time schedules. Also, if we find that something is wrong with a particular vehicle at the test stage; the customer has 21 days to amend problems outlined. “It is only in the past few years with the increased volume of commercial vehicles the demand for D.O.E testing became so heavy and we also specialise in related services such as tachograph calibrations and speed limiter calibrations. "These days there are far more commercial vehicles on the roads and so we are kept busy all the time. The trucks have to meet certain standards and the tests are run to a very high standard. “Our valued customers have helped us greatly by recommending us to others. Word of mouth has been a great thing for us for some time but there is room for us to be able to increase our sales and overall services. There is always potential to develop a business like this,” he added. "Due to the nature of some of our customers' busy schedules and long working hours, we will endeavour to facilitate anyone who cannot bring their vehicle to us during normal working hours. Damien revealed that to keep up with the latest changes to the legislation (of which there is many); the testers must go a refresher course twice a year. Having such a large customer base means that Priority VTN is kept busy all year round. The state of the art facilities ensure that any haulier that brings a vehicle in will not be waiting any longer than necessary. "We generally test one HGV and one LGV an hour on average, which is a decent ratio and it, is our aim not to hold onto the trucks for any longer than necessary, but no corners will be cut with regards to testing the vehicle. “We have set ourselves very high standards and to maintain those, we have to continue a high level of efficiency. 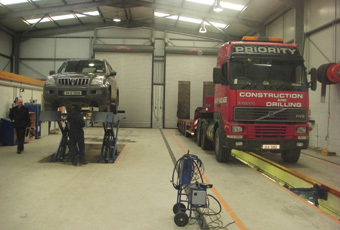 This is just standard procedure, we have guidelines to follow and that is what we do.” Commercial Vehicle Testing in Ireland is conducted by approved Vehicle Test Centres (formerly known as DOE Test Centres). For further information contact: Telephone numbers: 090 9676117, 090 9676104, 090 9676630, 090 9676635. Fax number: 090 9676269.